Jay is using Smore newsletters to spread the word online. _____On the eighth of August, Kerri Walsh Jennings and Misty May Treaner won Olympic gold in beach volleyball for the third Olympics in a row. “When I was throwing my body around fearlessly, and going for gold for our country, I was pregnant.” Walsh Jennings told Matt Lauer in an interview. _____May Treaner has retired after winning her third gold medal, "This is my last match," she says. "Beach volleyball's not going to be my career anymore... It's time for me to be a wife. I want to be a mom and share time with my family. All of us as athletes sacrifice more on the family end than people realize. And it's getting back to that. My mind says it's time. My body says it's time. And it's the right time." May Treaner said before her last match. _____The men from the United States did not medal, they lost to Italy and got 4th place, "It's a little bit different when you win: It takes about a month for it to sink in," Phil Dalhausser said "When you lose, it smacks you right in the face the second the ball hits the sand." _____At a young age do you think you could win gold in gymnastics?Well on Saturday July 29th, at the 2012 London Olympics Gabby Douglas, Jordyn Wieber, Aly Raisman, Kyla Ross and McKayla Maroney all part of the Fierce Five won gold in the team all-around. They beat Russia by 5 points. The U.S women's gymnastics has not won gold since 1966, when the magnificent seven won gold. There was a time when they were on the balance beam and Russia could have beaten them, but the were strong and got through it. _____Everyone but Jordyn Wieber got to the all-around. It was a shock that she didn’t make it through but she put that behind her and went out the next day and did the best that she could and it all pulled off at the end.The Fab Five new that they could rock the vault because they had McKayla Maroney the 2011 vault world champion. _____When Aly Raisman was done on floor, the last event, she was crying because she knew her and her team had done well and most likely had won the gold. Jordyn Wieber said “The feeling was incredible to have this gold medal around your neck, it’s really is an incredible feeling. That just shows how much team we are.” The Fab Five went home with team gold and Gabby went home with all-around gold. Missy Franklin won an Olympic bronze medal in the 4-by-100m freestyle relay. In London in 2012, she won three gold medals one for the 100m backstroke the second one she did the 200m backstroke and last but not least she won the 4-by-100m freestyle relay. The first time Missy Franklin got in to the Olympics was in 2012, she went full throttle, competing in seven events better than any USA female in history. 2011 FINA swimmer of the year award. Missy Franklin earns swimmer of the year award. Franklin gold medal for the 100m backstroke was won in the second race of a “double”---two-back-to-back race that left Franklin just 14 min between her 200m freestyle qualifying race and her 100m backstroke finals. It seems like certain athletes emerge from every Olympics as stars. Many Olympians bring home a gold, but an even more select bunch capture the public imagination in some ineffable way. Its early to say yet, but the excitement about swimmer Missy Franklin’s performance --- and her “just a normal kid” bio --- suggest she could be an All-American sweetheart of the London 2012 games. On August 5th 2012 a young man made history. Usain Bolt, a 6 foot 4 inch man won gold in the 100m dash and also won the title of fastest man in the world. Usain Bolt was born in Jamaica and has ran for his country ever since he was legible. He was born on August 21, 1986 and his middle name is St. Leo, as a child he enjoyed playing cricket and soccer with his brother Sadeeki in his free time. Usain Bolt has at least 6 gold medals and his world record speed is 9.63 seconds! He has been in 3 Olympics, start in 2004. Usain’s inspiration and motivation is his trainor, Lorna Thorpe. His parents are Jennifer and Wellesley Bolt and when Usain was young they owned the local grocery store. Currently Usain weighs 198 pounds and is 26 years old. “For me, I’m focused on what I want to do. I know what I need to do to be a champion, so I’m working on it.” says Usain bolt. _____The Ryan Lochte and Michael Phelps rivalry has been in the olympics since 2004 when they first competed in a 4-by-200–meter freestyle relay, but since then Michael has broken the record for having the most medals from the olympics, a total of 22 medals comparing to Lochte’s 9 medals. _____Phelps and Lochte both had to work to get to the olympics. So I’ll tell their stories. Michael Phelps was born on June 30, 1985 to Fred and Debbie Phelps, his sister Whitney and Hilary encouraged Michael to take up swimming because they were swimmers too. First he took up and mastered backstroke. Then after he saw swimmers compete at the 1996 Summer Games in Atlanta, he dreamt of becoming an olympic champion. His swimming career at the Loyola High School pool. He met coach, Bob Bowman, and started training at the North Baltimore Aquatic Club. Then was accept to the 2000 Olympics in Sydney Australia but didn’t medal at all. _____Ryan Lochte was born in Canandaigua, New York on August 3, 1984 soon after when he started swimming he was 5. So Lochte started swimming at an early age.His parents said that he had a passion for swimming at 5 or 6.when he was “I enjoy racing so much. Ever since I was 8 or 9, I trained every stroke, because it was the only way I could race a lot.” He said after the London 2012 games. When he was a junior he decided to pursue his swimming as a career. After graduation, he went the University of Florida, then named NCAA Swimmer of the Year twice.Next Ryan qualified for the 2004 olympics in Athens Greece and swam against Phelps for the first time in the olympics and received the gold medal in the 4-by-200–meter freestyle relay. 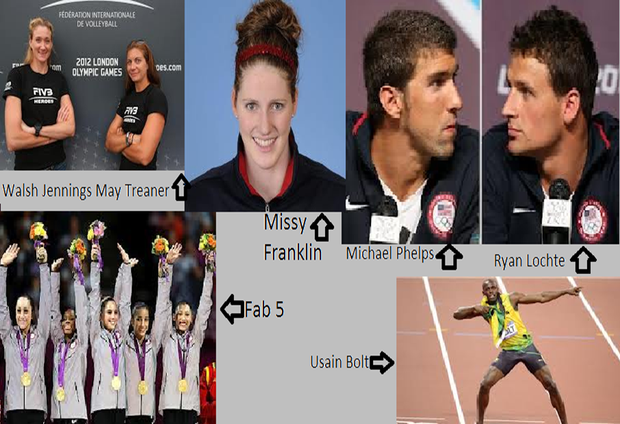 _____So their careers together have made history in the Olympics with their rivalry but they will always be the best.